Comtesse du Cayla is from France, being released in 1902. 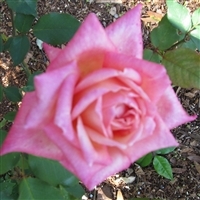 This is a very well liked rose known for its very rapid and generous rebloom. An Earth-Kind® rose from 1869 this is a popular selection for white flowers. Blooms tend to be generous in numbers. Duke of Edinburgh is from the UK in 1868. Shade tolerant, large full blooms, moderate size plant. A more recent French introduction from 2003 the flowers on this shrub display a pleasing apricot blend. Gloire des Rosomanes is a French rose from 1825, vigorous growth with clusters of crimson flowers. Bred in the USA and introduced in 1956, this was an ARS All American Rose Selection. Introduced in 1955, the depth of color will vary with the seasons. Henri Martin was introduced in France in 1862. He flowers in small clusters starting as a shiny crimson and fading to deep pink. He was leader of the group which conceived of and developed the Statue of Liberty. Brad by James Bailey in 2002, this was introduced in Florida, it is a winner of Gold Certificate, ARS Trial Grounds, 2007. A generous bloomer. Joseph's Coat is an American introduction from 1964. He has large blooms which vary greatly in color, yellow, purple, peach, pink and red could all describe the blooms at various times. Of German breeding in 1891, large blooms of 100 petals with upright growth. Blooming in clusters of flowers through out the growing season, this rose has a lemon, tea fragrance. It may be grown as a climber or maintained as a shrub. An introduction in Italy in 1995, this variety was from the Lijiang Road in China where it grows in the wild.